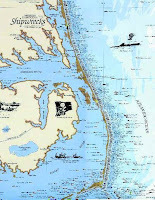 There were so many shipwrecks off the coast of North Carolina at Cape Hatteras that the area became known as the "Graveyard of the Atlantic'. Pretty gruesome title for such a beautiful coast. In a similar vein of thought, President Obama's recent pronouncement calling for another 'commission' by executive order to study what is wrong with our federal budget and report back to him and Congress about what can be done to get us out of this mess should be received by a national collective groan and a scream of "Oh, no! Not another one of those! Please!" It is a dumb idea whose time has come and gone. Like 18 times since 1975. All great ideas, all great people, (of course, we thought we were on the greatest one in 1994), all great commissions. All shipwrecked once they crossed the Potomac and sunk to the bottom of the Reflecting Pool in front of the Capitol, never to be seen again. Commissions on budgets and entitlements are a complete political dodge by those in power. They are almost as cowardly as passing along this enormous debt to our children and grandchildren. We already have a 'commission' to study and make decisions on changing federal spending and we call that thing the "U.S. Congress"! And it is the ONLY Constitutionally-established body in this country that has the authority to make decisions on our behalf to raise taxes and make spending decisions for our Republic on an annual basis. So here we are almost 36 years later after first budget commission, which was, of course, on Social Security, and Congress just raised the debt ceiling to $14.9 trillion this past week. So how are these commissions working out for you? Here is the only way to ever slay this dragon. We have to have hundreds, if not thousands of Boomers and post-Boomers run for political office and advocate the proposals outlined in these reports and level with the America people. We have to introduce each of these proposals from every one of these commissions, line-by-line, on the campaign trail first and then on the floor of Congress for an up-or-down vote on C-SPAN for all the world to see. Anti-slavery proponents did not hide behind the veil of a 'bipartisan commission' in England or America in the 19th century. Brave souls such as William Wilberforce talked openly and with conviction about abolishing the slave trade and slavery itself in the broad daylight, ran on a platform to do so and worked within Parliament to achieve that noble end. If you don't ask and allow your elected representative to pass these much-needed and long-overdue changes to be made to Medicare and Social Security, the only option left is to raise your annual income taxes by at least $5000 per person and keep it that high for the rest of your lives. Cause if we don't make one of those two decisions, either reform/reduce entitlement spending or raise your taxes, we are going to saddle our kids with an unconscionable debt that we can not continue to allow to happen. Passing these changes to our entitlement programs is the right thing to do. Passing along more debt is the cowardly thing to do.